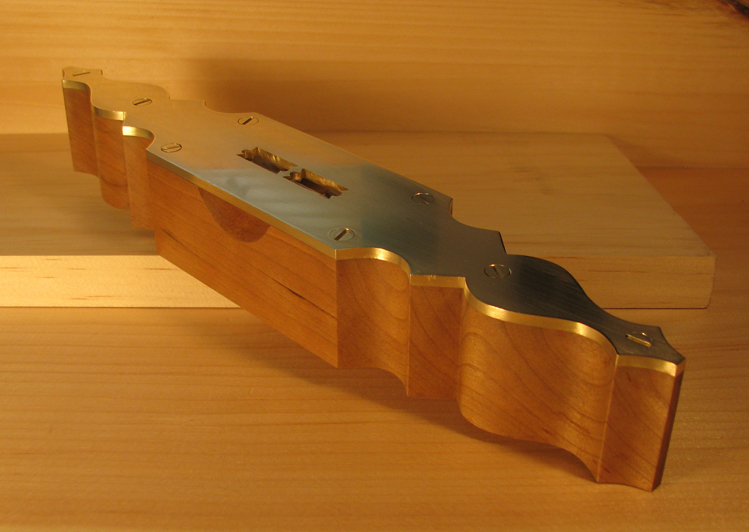 The scratches on top of my cherry and brass level were really distracting and made it look a little slipshod. So, I took friends' advice and ordered polishing papers, which worked really well. I went through these successive grits: 400, 600, 1200, 4000, 6000, and 8000. The level is much shinier than before, but I could have spent a few more minutes on some areas where light scratches still remain. And there they shall. I've moved on to other fun projects. 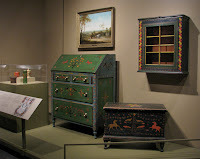 The best way I can describe the work in the gallery at Winterthur that displays the 18th-century southeastern Pennsylvania furniture from the Paint, Pattern & People book is this: the pieces simply glow. The combination of the lively painted surfaces, gallery colors, wall hung paintings and deep, rich tones of the various woods make this collection a warm and vibrant experience. There is nothing that compares to seeing these pieces in person. While the photography in the book is wonderful, a two-dimensional image cannot convey the full impact of the actual work. Granted, this is my favorite time period and these are pieces from the area in the U.S. that I love most, but I'm quite sure that any woodworker can appreciate the craftsmanship and skill that built them. 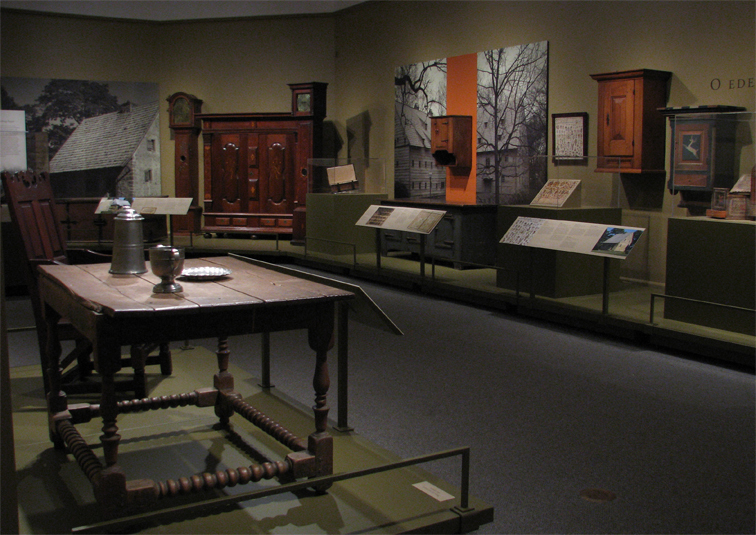 The fact that you can get so close to the furniture that you can look beneath and behind some of them means discovering things such as the cross-wedged through-tenons in a Moravian chair seat; the points made by compasses as they scribed arcs for line and berry spice boxes; pencil lines that sketched the initial designs for painted chests; and table tops rubbed smooth and shiny by a thousand hands. All the marks left on the furniture give us a window through which we can imagine the time when they were made and used. The worn corners on the feet of a chest-over-drawers brings to mind an image of a woman sweeping the wood floor beside it while children rough-house a bit too energetically in its vicinity. By following the lines of a carved pediment on a high chest of drawers, we can envision the movement of the woodworker's hand as he slides a gouge along the rim. The slight inconsistencies in the flow of the curve confirms that it was made by hand; the subtle imperfections forever capture the marks of the craftsman who made them. As woodworkers, we know what tools were used to make various cuts, and we instinctively "build" the piece as we study the tool marks. So this exhibit becomes an interactive one for us. One thing that struck me about many of the pieces is the attention to detail, even in the smallest elements. 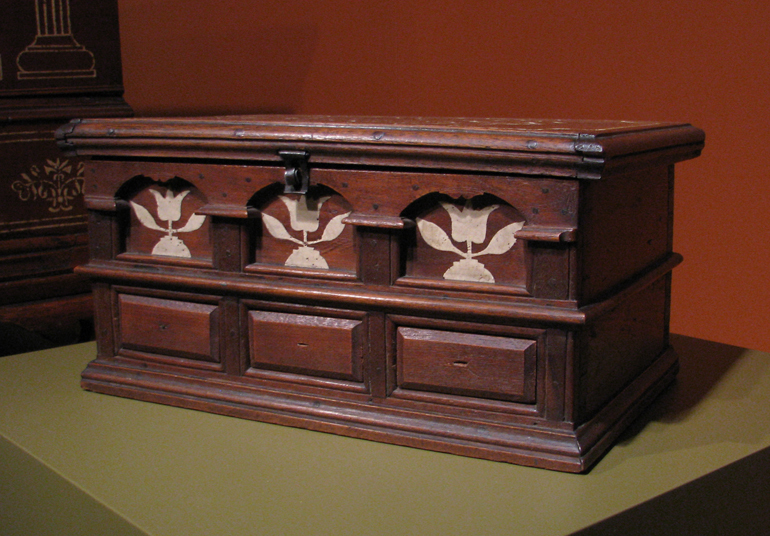 A tiny door within the gallery of a writing desk displays delicate, yet complex moulding. 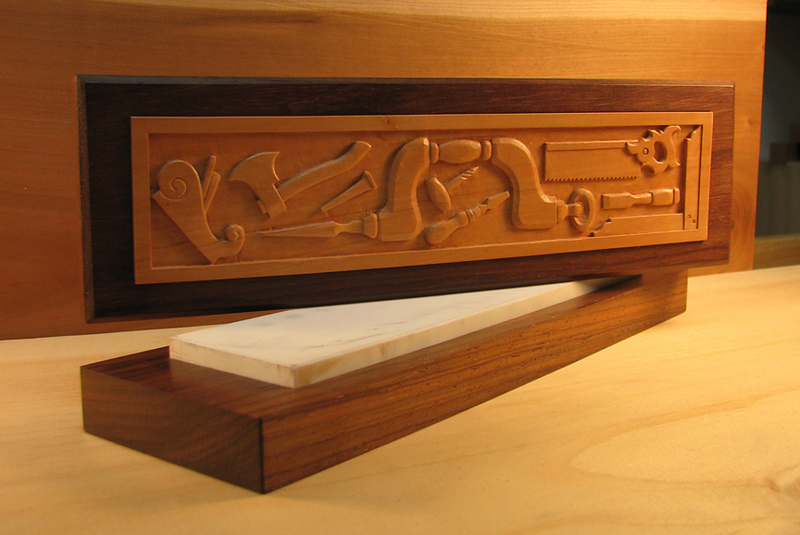 A small box showcases row upon row of detailed inlay made from hundreds of pieces of contrasting wood. Even the iron work is artistic. While these country craftsmen were influenced by their big city counterparts and brought with them styles of ornament from the countries from which they emigrated, it seems evident that they applied their own creativity to the mix, making each piece one-of-a-kind. The items in this collection are the very finest I've seen from this era and region. 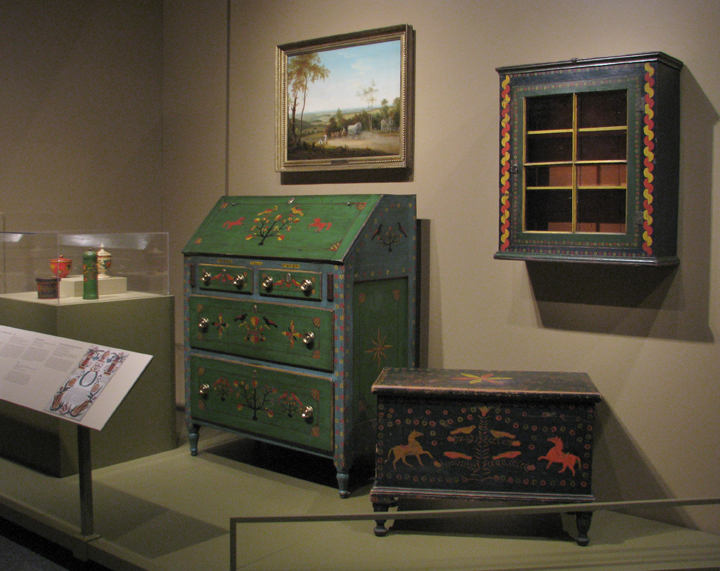 The colors are so bright as to look newly-painted, both on the furniture and in the framed illustrations of the region. For centuries, these pieces absorbed and reflected the lives of the people who made and owned them. Perhaps that's why they seem to have so much personality and soul. Our projects are part of us. The things we build today will document details of our lives and leave future woodworkers to wonder about us. We are part of a continuum. 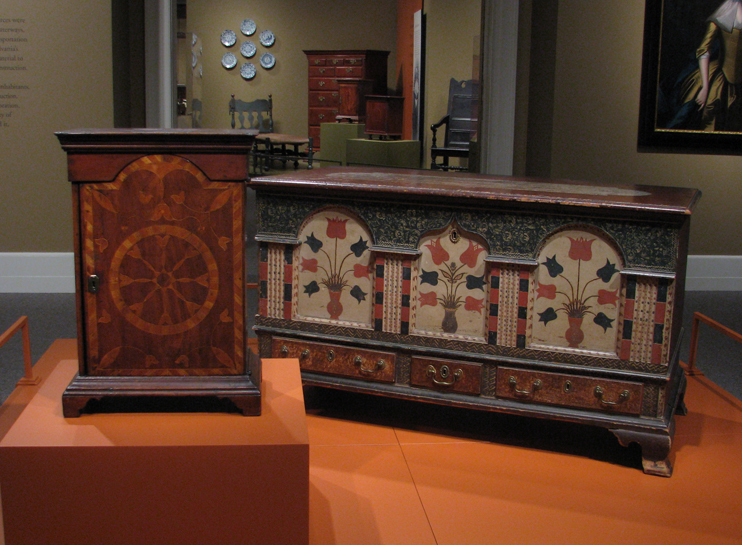 And these 18th-century pieces remind us to build something worthy of bearing witness to our history. Please note that photography is not permitted in this exhibit. 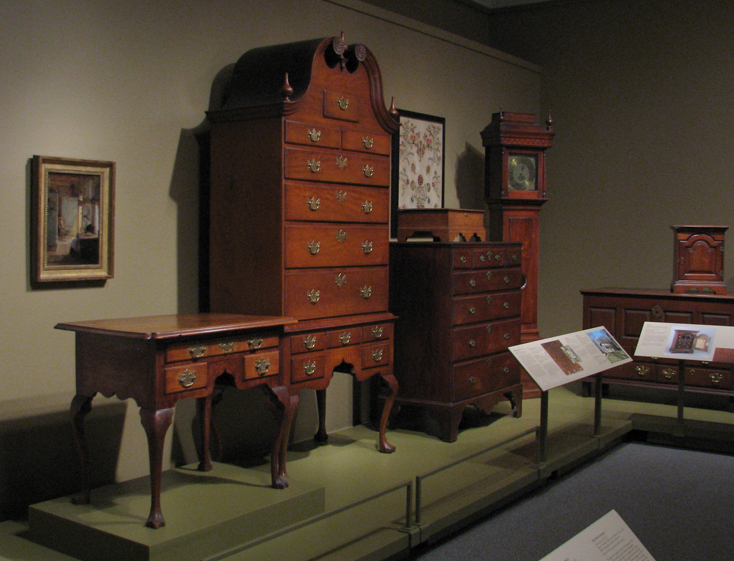 I'd like to thank the Winterthur Museum for allowing me to photograph these marvelous pieces. 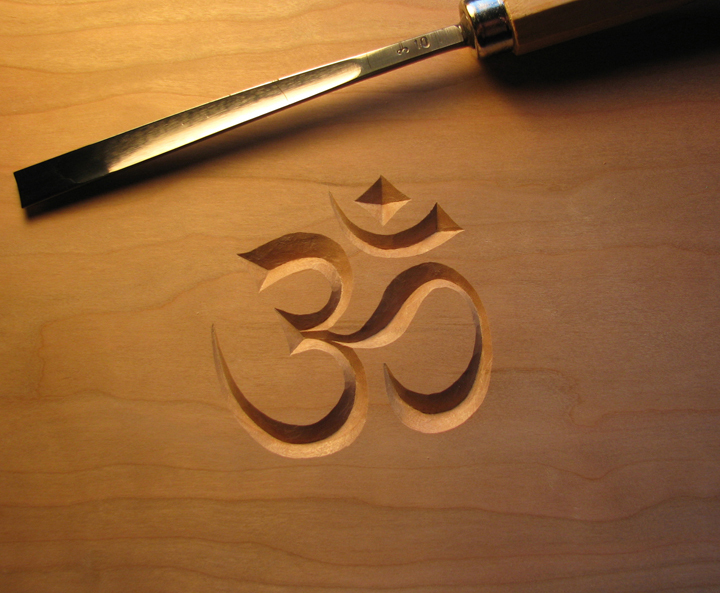 Wood Carving: Where Do You Start? Disclaimer: I am not an expert carver. I don't even play one on TV. Feel free to challenge, contest, throw tomatoes at, or add your thoughts to any of the following. 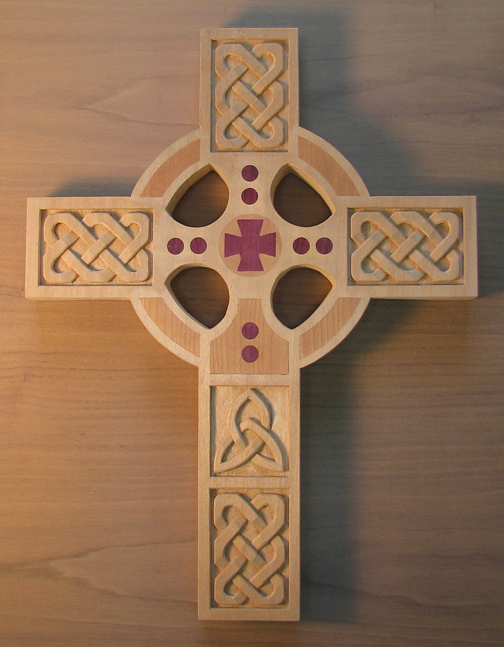 There are several types of wood carving: chip, letter, and relief carving; and carving in the round. 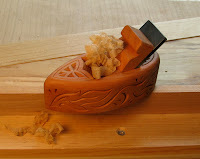 Carving tools include knives, chisels, gouges, and mallets. For carving in the round, rasps and files are helpful. Gouges come in many shapes and are gauged by their width and sweep (the amount of curve on the cutting edge). 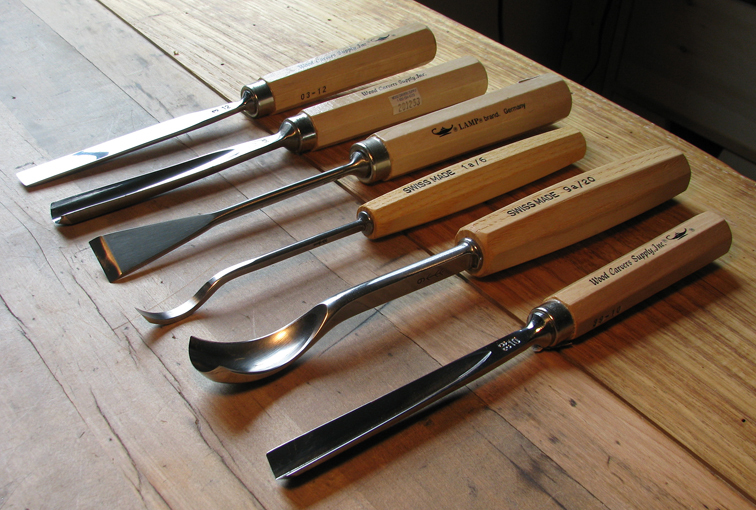 Included in the mix are straight, bent, fishtail, in-cannel (the bevel is on the inside rather than the outside), spoonbit, and V-gouges. Many are also available with short or long handles. Like any new woodworking venture, it can be a little daunting to know where to start. 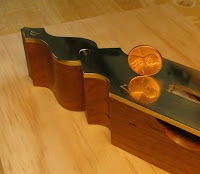 Several woodworkers have emailed me with questions about which tools they need to carve wood. They ask if it’s best to invest in a set of carving tools. My response is always the same: find a project you like—from a book or magazine—and purchase the tools you need to carve it. Publications will often provide you with a checklist of tools for the project. Chances are you’ll use those tools again because you used them to carve a project you like. Whereas, when you buy a set, there will be one or more tools you will never use. Now, what type of carving would you like to try? Chip carving is the easiest. You need only two tools—a primary knife and a stab knife. Chip carving consists of three basic, rather shallow cuts. Once you master them, you need only arrange them to create your own designs. 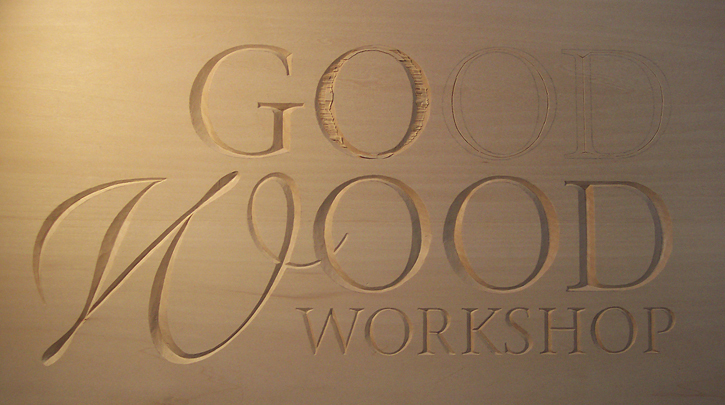 Lettercarving can be complex or easy. You can use a large variety of chisels and gouges which match every conceivable shape you need. Or, you can simply use a chip carving knife. With chip carving, however, you will be limited by the type of wood (certain hardwoods can very difficult) and the size of the letters. I use a different technique which requires only one chisel and one shallow-sweep gouge. The size of the tools depends on the size of the letters. With this technique I can carve just about any type of wood and any size or shape letter. Relief carving is where you start getting into some money. I do not have a huge variety of gouges, and try to make do with what I have. As you begin to carve, you will realize what you’re missing from your collection. Keep in mind, just as you don’t need to have chisels ranging from 1/16” to 2 1/2” and everything in between, you can often get by with less. Carving in the round is like relief carving only the project is carved on all sides, as with a ball-and-claw foot. Rasps can remove lots of wood in short order, and files refine the shape. There is nothing quite as luminous as the smooth facets left by a chisel or gouge however, so I remove all rasp and file marks with them. I do not use sandpaper to smooth portions of carved pieces—the abraded areas have a different appearance than and don’t blend in with the sheared surfaces created by cutting tools. Plus, sandpaper rounds over crisp edges. With any carving, you must have sharp tools. I can’t stress this enough. Dull or semi-sharp tools will only frustrate you and you’ll never produce the results you want. I use ceramic-, water-, and slipstones, and strops charged with honing compound. 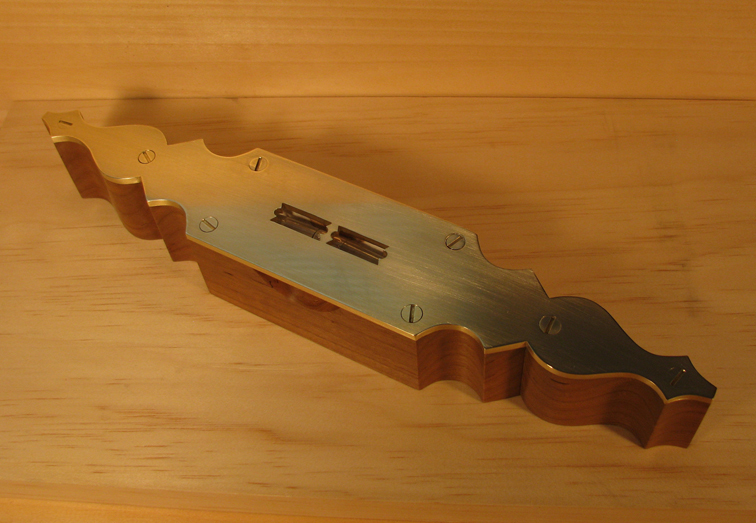 It’s much easier to maintain an edge by frequent honing than it is to completely resharpen a tool. You must also learn to read the grain. The “petting-the-hair-on-a-cat” analogy never resonated with me. Maybe I’ve been petting cats the wrong way all these years (which might explain the scars), but I came up with a different image—that of a skier. Always carve downhill—with the grain—and the trail you leave behind will be smooth. If you carve against the grain, the direction of the cut will leave the fibers that are ahead of your chisel or gouge unsupported, resulting in tearout. And you'll fall off a cliff. And die. If that visual isn’t working for you, think of grain as walking up or down steps—it’s much easier to walk down a flight of stairs. If you’re looking for good books, I recommend Wayne Barton’s book “The Complete Guide to Chip Carving”and Richard Butz’s book “How to Carve Wood.” I have not found any reference that shows the exact lettercarving technique I use (which was taught to me by a sign carver), but I plan to make more videos on the subject in the future. 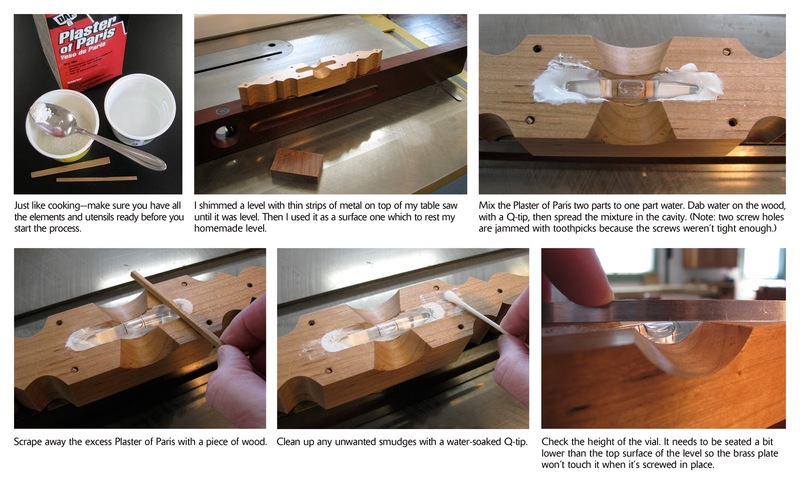 I wrote the above entry for Marc Spagnuolo, The Wood Whisperer, who invited me to be a guest blogger on his website. Thanks, Marc! Well, as glamorous as I'm willing to go without the assistance of a boa and leopard-print fabric. The level is sanded to 400 grit and has four thin coats of wipe-on polyurethane and two coats of dark paste wax. 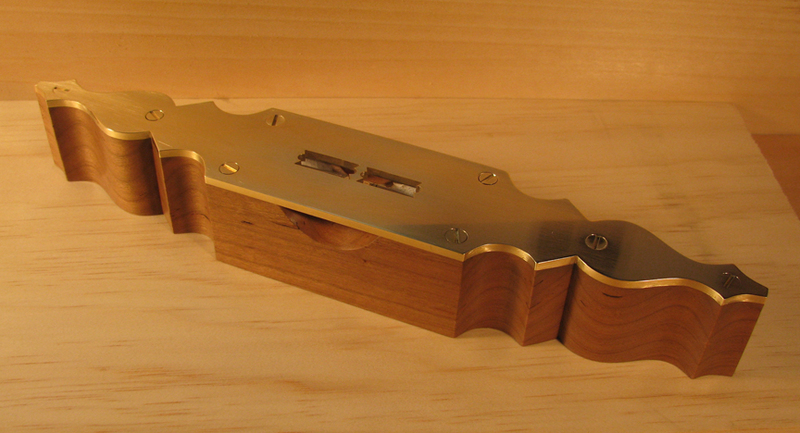 Over time, the brass and cherry will darken (my preference). One person asked in the last post what happens if the wood moves over time. How will I fix it so it's still level? I'll either lay a sheet of sandpaper on my table saw and rub the bottom of the level back and forth until it's flat again or I'll handplane the bottom. Thanks to another commenter for this idea: you can check for level by laying it on your table saw, taking note of the position of the bubble, spinning the level 180º, and checking the location of the bubble again. If it's in the same place, your level is level. The brass is not polished as smoothly as I'd like. I rubbed it with 220, 400, 1200, and 4,000 grit sandpaper and still there are scratches. I asked an old college chum who now makes jewelry (and some very cool tags for dogs) how she achieves a mirror polish on metal. She uses polishing papers, working through the entire set, then puts the jewelry in a tumbler. While I'm not planning to invest in the last item, I am going to try the paper. I don't know if it will also work on wood or not but I'll give it a try. The fact that the sheets are washable and reusable (and inexpensive) is pretty enticing. 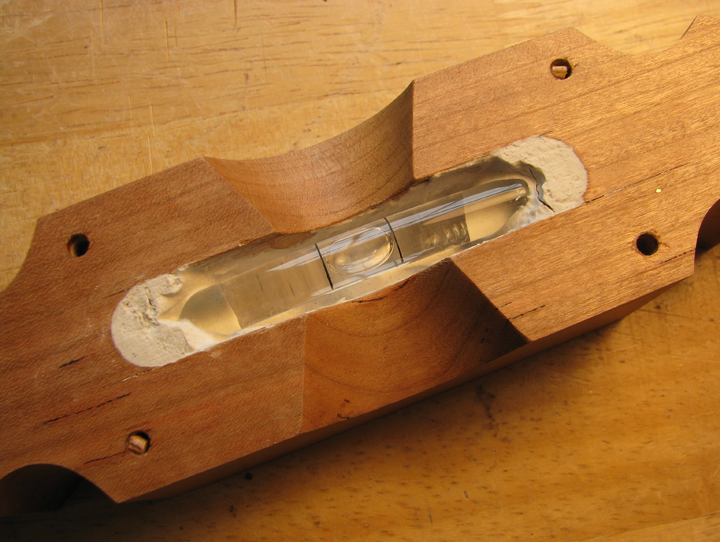 According to Herbert P. Kean's book Restoring Antique Tools, mounting the vial in place can be achieved by filling a bathtub with a few inches of water, floating a board, laying the level on top of the board, and adjusting the vial until it's level. I tried this with a large tub of water, but the board did not support a block of wood very well. It tended to tip, become soaked with water, and sink. Fortunately I tried this with a sacrificial block of wood rather than my homemade level. Instead, I sat one of the nice antique levels I own on top of my table saw and shimmed it with two thin metal rulers until the vial showed that it was level. I used this surface on which to sit my level. I considered using spackling to secure the vial in place, but decided to use Plaster of Paris instead. It sets up quickly and it's the same substance that was used in antique levels. Mix the plaster two parts to one part water, dab water in the wood cavity of the level, and spread the mixture with thin strips of wood. Through trial and error and a few moments of panic, I found that it's best to let the plaster set up a little bit, then push the vial in place. You need to consider the "windows" through which the vial will be viewed—there should not be any plaster on these areas of the vial or it will be noticeable and unattractive. Make sure the vial is sitting a little beneath the top surface of the level. That way, when the brass plate is screwed in place it won't touch the vial. You also need to be sure that the convex curve in the glass is arcing upward and that the vial is positioned in the center of the cavity. I used thin strips of wood to scrape away excess plaster, then used a moistened Q-tip to clean up smudges. I pre-finished the wood before I seated the vial. In a few days I'll rub on some paste wax and take some glamour shots of the completed project. The previous three blog posts about making this level are 1, 2, and 3.